Ever since the city of Newark was founded, trees have played an important role in the development of its character. The very act which created Newark, the signing of the treaty between Robert Treat and the Indians, is depicted taking place under a tree. This may well be true, as the tree provided shade, a trunk upon which to rest and an easily recognizable landmark. 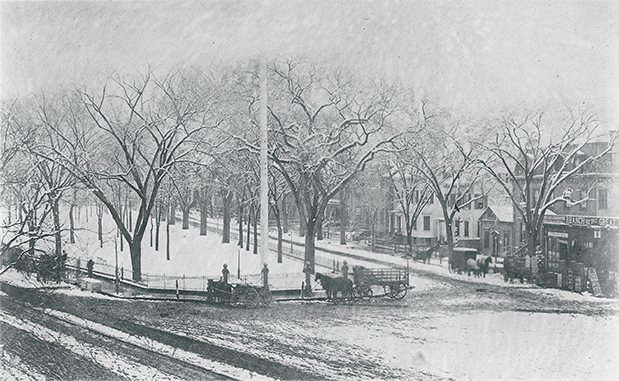 History shows that Newark's founders, in laying out the city, reserved certain areas for trees, beauty spots which include today's Military, Washington and Lincoln parks. As Newark grew, trees were planted on every street to preserve a sense of beauty and charm within the city. As we look at some of the older photographs of the city, the presence of trees is evident on even the busiest of thoroughfares. In the residential sections, trees line the streets, their branches often meeting to form a shady roof over the roadways. While progress has forced the removal of some street trees, Newark's parks still offer the tranquility these trees provide. In Military Park still stands the so-called Washington Plane tree, which supposedly offered its shade to such distinguished visitors as George Washington, Thomas Paine and Abraham Lincoln. In Branch Brook Park, the many types of trees, quiet walks and scenic waterways help visitors forget the pressures of city life and relax in a more natural setting. During the changing seasons, a variety of colors and sights delight the eye, the nose and the sense of general well-being. And, on Arbor Day, we stop to reflect on the many ways in which trees contribute to the charm and serenity of our city's streets. In recent times, thousands of trees have been planted along city streets, thanks to federal funding and local advocacy. Behind every good idea, of course, there are always one or more dedicated individuals who inspire such projects. Many of the trees which line Newark's streets and fill its parks are hardly there by accident. They are the result of thoughtful planning and steady maintenance over the years. The guiding light behind these efforts for 42 years was Carl Bannart. When Bannart came to Newark in 1903, shade trees and stately homes still graced Broad Street as well as the city's residential sections, an atmosphere which enchanted him. Born in Switzerland, Bannart came to this country alone at the age of 11. He studied in the New York schools and at Boston University. Although he had been a printer and studied law, his first love was nature. In 1905, Bannart became secretary of Newark's Shade Tree Commission. When Newark adopted a commission form of government 12 years later, he moved to the Department of Parks and Public Works, which took control of shade tree activities. Bannart was personally responsible for the planting of 60,000 trees of many varieties which lined both sides of the 300 miles of Newark streets. Constantly he studied government bulletins and other materials related to their care, and, at the same time, published reams of leaflets to share with the public the information he discovered. He also was active in civic affairs and organized groups to protect trees. To acquaint young people with their importance and their care, Bannart organized the Shade Tree Protective League in the Newark schools, the first club of its kind. During both world wars, he presided over many educational groups to encourage and teach gardening in yards and vacant lots, a program eventually known as Victory Gardens. As a leader in the forestry field, he was named in 1940 to the TreeExpert Bureau of the state Department of Conservation and Development. Throughout his career, he served also as a consultant to many other municipalities, helping their officials set up and maintain shade tree programs. Bannart was also an adviser on landscaping and tree planting for Atlantic City's 100-acre recreation area that was laid out in 1924. Carl Bannart's interest extended into other areas as well. A former president of the New Jersey Urban League, he was also an active member of Third Presbyterian Church and the Orpheus Club, a choral singing group. He served also as secretary to the State Association of Lions Clubs. In 1941, at the age of 75, Carl Bannart retired and moved with his wife to Sarasota, Fla. Their son, Carl T., remained in New Jersey to complete his studies at Princeton University. With 40 years of continuous service to his credit, the elder Bannart was one of Newark's longest-serving city employees. Most of all, he left behind a legacy of beauty for future generations to enjoy and preserve.